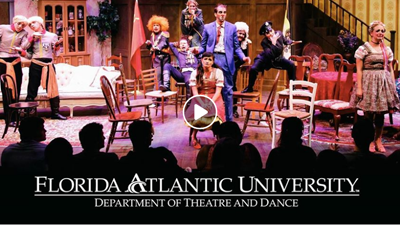 Welcome to FAU’s Department of Theater and Dance in the Dorothy F. Schmidt College of Arts and Letters! We are a community of artists and scholars who believe in the collaborative exploration of the human spirit through the study, practice, and celebration of theatre and dance. We strive for excellence and expect excellence of our students as they train, study, and practice to become skilled and inspired artists. We are also firmly committed to encouraging and celebrating diversity in our community. Theatre has been an integral part of the FAU experience since its founding in 1964 and that tradition continues today. We are proud to offer an MFA with a specialization in either Theatre Performance or Design and Technology, a BFA in Theatre Performance, a BA in Design and Technology, a BA in general theatre studies, and minors in both Theatre and Dance. We endeavor to look at our students as individuals. As such, we will consider your individual aspirations and goals as we help you become the best artist you can be. We believe in a holistic approach to training that, regardless of specialty, requires some practical study in all of the areas of theatre and dance production and our students are encouraged to become involved in the creation of theatre and dance from their first day on campus. The Department of Theatre and Dance produces an extensive season of entertaining and thought-provoking work. Exploring a wide variety of material, we produce four main stage productions and three dance concerts during the regular academic year. Then, in the summer, we stay busy producing our Festival Repertory season that has our students earn points toward their membership in Actor’s Equity while working side-by-side with professional actors as mentors. In 2015, we established Theatre Lab, a resident professional company, which brings professional theatre to campus along with lots of opportunities for our students to continue to gain professional experience. Dedicated to the development of new plays in American theatre, Theatre Lab has already brought to campus many of America’s best playwrights including Marsha Norman, Israel Horovitz, Steven Dietz, John Guare, Michael Hollinger, Deborah Zoe Laufer, and Carter Lewis to name just a few. We view our respective art forms as creative, research disciplines that require dedication and commitment. If you’re a student looking for a rich environment in which to hone your skills and talent and a supportive environment that will challenge you to become the best you can be, then FAU is for you. We look forward to welcoming you to your new artistic home! CLICK HERE FOR DRIVING DIRECTIONS TO OUR THEATRE EVENTS AND OTHER IMPORTANT INFORMATION! Unless otherwise specified, tickets are available by calling 561-297-6124 or by visiting www.fauevents.com. Please notify the Department of Theatre and Dance at (561) 297-3810, five working days in advance of event, if special accommodation for a disability is needed. All shows, artists, dates and times are subject to change. Please note there are no refunds or exchanges.